Don't be confused by the term "Cloud TV" that Toshiba uses to describe their L7300U 1080p HDTV. The more common descriptor is Smart TV. Potato, potato, basically these TVs can be connected to Internet content providers, like Netflix, Hulu, Pandora and Facebook, through their apps. In the last couple of years, Smart TVs have begun providing more interactive features and content above and beyond the usual channels. The Toshiba L7300U continues that trend. Not only can you link this Cloud TV to sites like YouTube, you can tweet or search the web or set up a personal calendar. I have never been a big fan of recruiting my TV to perform tasks that seem better suited to a tablet mainly because the TV remote has never been an adroit navigation or data entry tool. Toshiba solves that issue by including a full-sized wireless keyboard with a built-in touchpad as part of the L7300U package. If you are buying this TV for its Cloud features, then this keyboard will make your interaction much more efficient and enjoyable. If all you are not interested in sticking your head in the Cloud, then L7300U is more than you need. You might consider a new Toshiba model like the much less expensive 50L2400U that should be available in March. In addition, the L7300U series is not 3D capable. 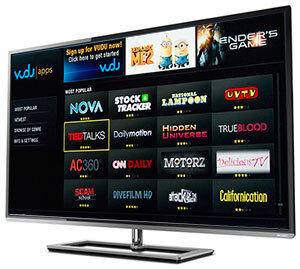 If you are looking for a 3D TV with similar Cloud features, Toshiba offers the L7350U model. Toshiba integrates a passel of high tech terminology into its top shelf L7300U, like ClearScan 240Hz, CQ Engine and DynaLight. And this LED backlit TV does produce very respectable picture quality. The audio fidelity is OK for tiny 10W speakers. Toshiba includes both Wi-Fi and Intel WiDi connectivity and a good selection of apps. There is no integrated video camera for Skype calls but the keyboard is a real plus. I still don't miss the lack of voice recognition, motion control or 3D playback. Call them whatever tickles your fancy - Cloud TVs or Smart TVs - they are not the easiest things to use. They take time to study and set up, and the Toshiba is no exception, even with the included keyboard. On their website, Toshiba lists the suggested price for the 50L7300U as $1399, currently discounted to $1099, which is still a premium for a 50-inch TV in this highly competitive marketplace. After a quick search on the Internet, I found a drop to about $875, which I consider a much better value. When Toshiba's 2014 models begin to roll out, you may be able to grab the 50L7300U at closeout pricing.